This morning when I woke up, I wanted to do something a little different with my eggs. When I saw the vegetables we had in the fridge (asparagus and Brussels sprouts), I started to wonder why some vegetables are a common find at breakfast time, while some are not. 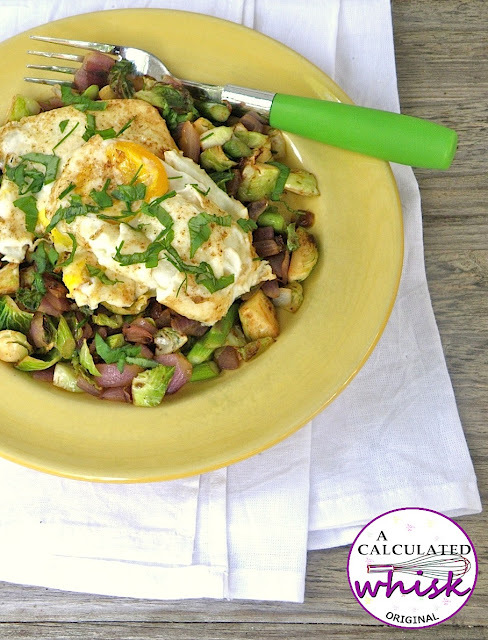 Mushrooms, peppers, and onions are often seen as omelette fillings, but Brussels sprouts not so much. I am going strong on the fourth day of my Whole30! I’ve been taking a look at my recipe index, trying to find more recipes I can tweak to make them paleo. I like variety, and it can’t ALL be about almond flour pancakes and zucchini noodles. The more dishes I have in my paleo arsenal, the more likely I am to successfully stay full and on track. This weekend is going to be a big challenge, because I’m heading down to Austin for my cousin’s wedding. It’s going to be really hard to say no to tacos and wedding cake! I’m thinking about relaxing my standards a TINY bit while I’m there…nothing too crazy, but maybe a little barbecue sauce. Do you guys know any great Austin restaurants where I might be able to get great food without straying too far from my paleo intentions? If you do, leave me a comment! I’ll take some pictures while I’m out and about and share with you when I get back. So, without further ado, here are ten recipes from my index along with easy ways to make sure they’re paleo. 1. 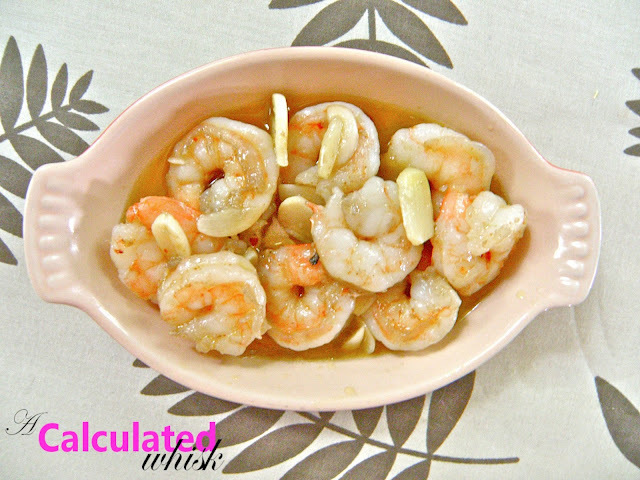 Gambas al ajillo–this recipe is ALREADY paleo! It would be great over zucchini noodles. 2. 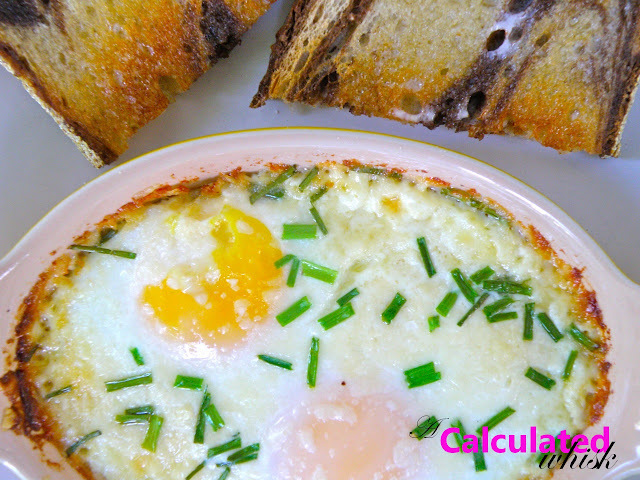 Baked Eggs with Chives–omit the parmesan and use coconut milk instead of the cream (or just leave that out). This would be great with some more herbs added in, too. If you haven’t tried baked eggs, get on it! 3. 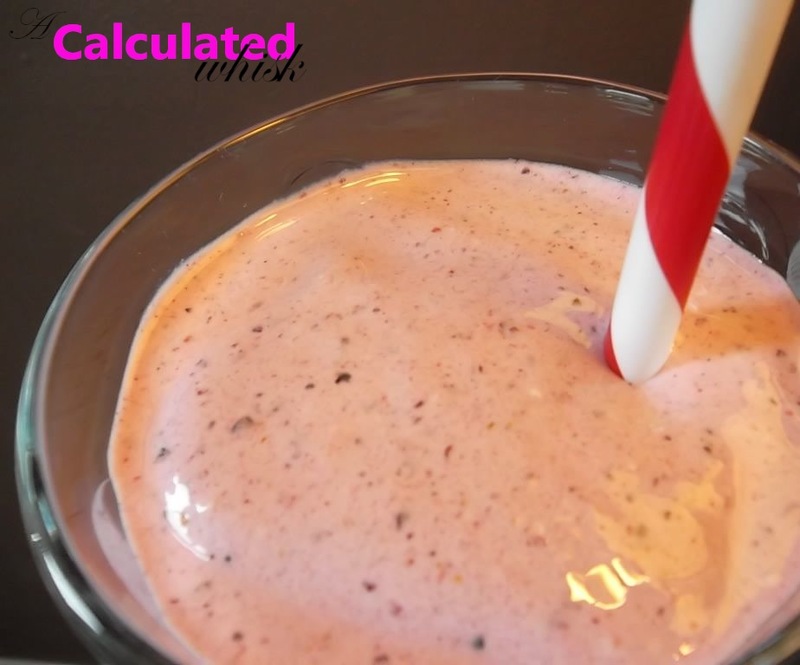 Berry Coconut Smoothie–leave out the protein powder, or use a paleo version (I just discovered this site and haven’t tried their products, but it looks interesting!). 4. Chocolate Mousse–sweeten with honey to taste instead of sugar. 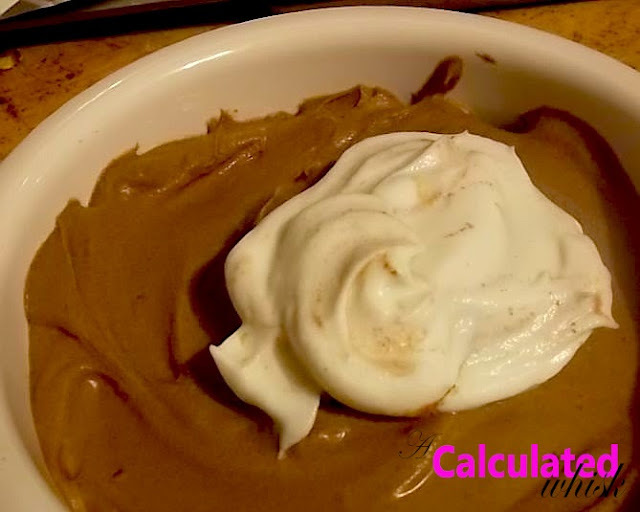 If you haven’t tried this, check it out–there is a secret ingredient and it’s SO easy and decadent! 5. Bacon Wrapped Shrimp with Creamy Rutabaga–use coconut milk instead of the milk or cream. 6. 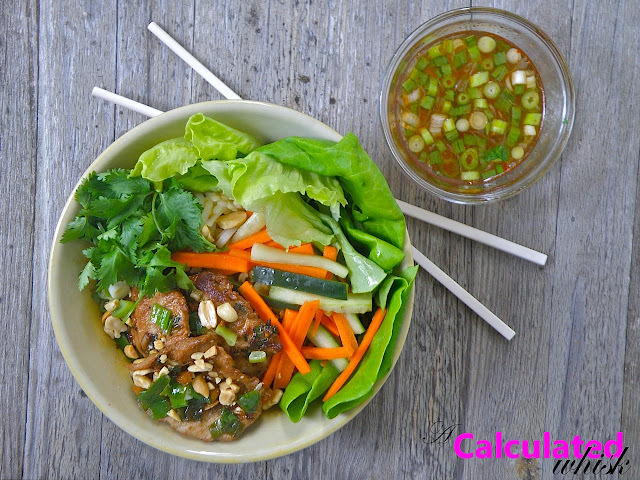 Vietnamese Pork & Vermicelli Bowl–omit the sugar and vermicelli (add more veggies if you like), use coconut aminos instead of soy sauce, and cook the scallions in coconut oil instead of canola oil. 7. 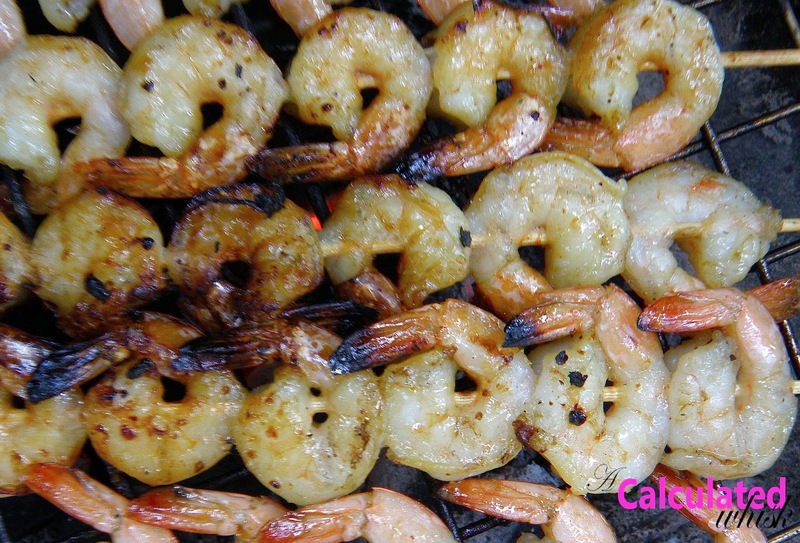 Garlic Honey Grilled Shrimp–already paleo! 8. 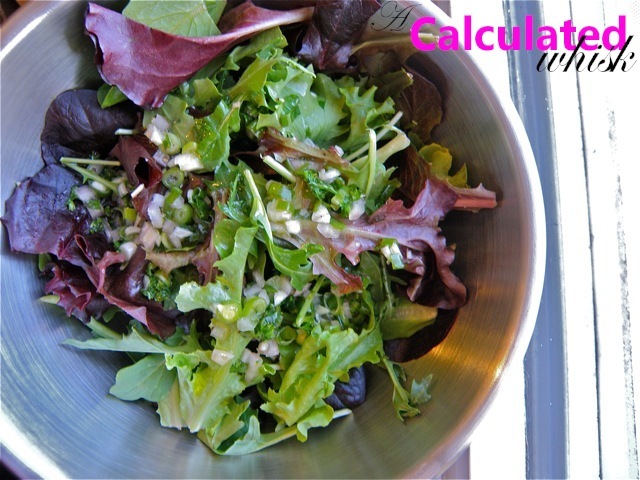 Spring Salad with Citrusy Shallot Vinaigrette–already paleo. It would be great with some of the garlic honey grilled shrimp on top! 9. 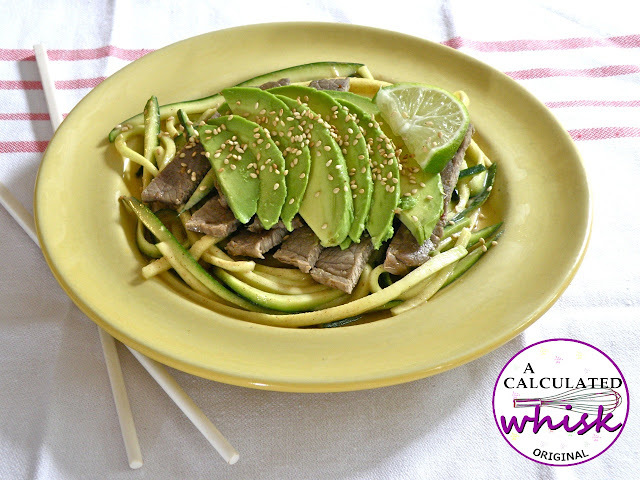 Jerk Chicken with Avocado & Papaya Salad–omit the sugar from the jerk seasoning. 10. Coconut Frappuccino–sweeten with honey instead of agave nectar. 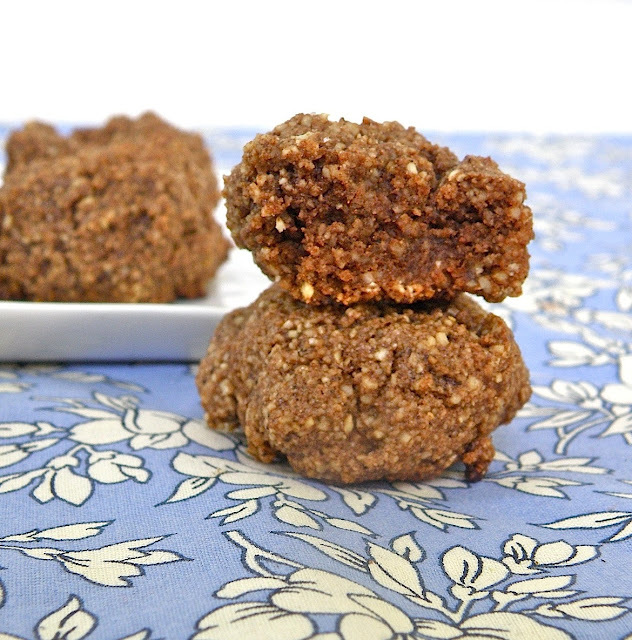 If you have any links to paleo recipes you love, leave them in the comments! After all those pancakes, I was ready for some meat. I cooked this steak on my George Foreman grill which, I’m ashamed to admit, had been riding in the trunk of my car ever since I moved back up from Houston two years ago. No worse for the wear, the grill worked fine when I finally brought it inside today. You can also cook your steak on a real grill or stovetop in a grill pan or heavy skillet. This salad is my first attempt at using zucchini as noodles. I think in this recipe it really works. You aren’t tricked into thinking you’re eating real noodles, but the long, thin noodle shape is the perfect vehicle for the sauce, and the raw zucchini still has a little bit of a crunch to it. 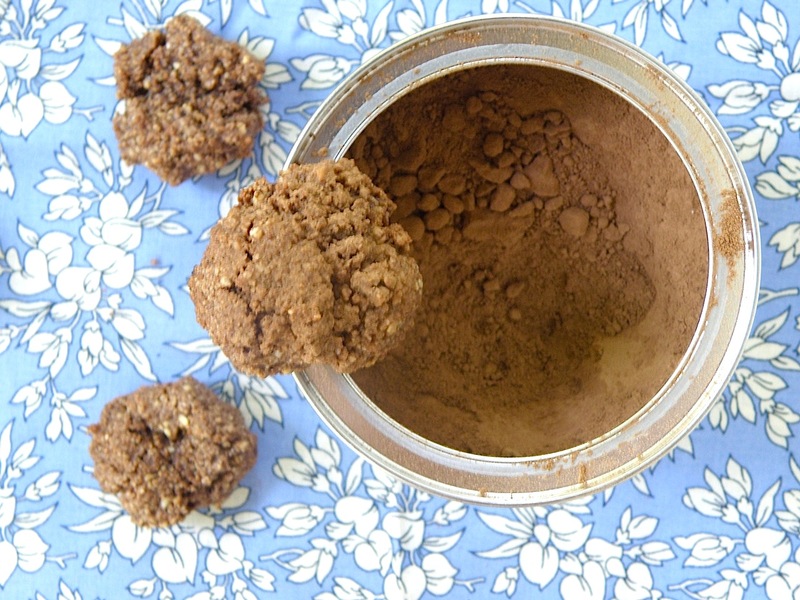 Another ingredient note: this recipe calls for coconut aminos, which are a paleo replacement for soy sauce. In my opinion, the flavor is very similar. You won’t taste any coconut here. If you’re looking for coconut aminos, I found mine at Whole Foods. You can also just substitute soy sauce if you’re not avoiding soy. To make the marinade, combine all ingredients in a shallow bowl and toss with the steak to coat. 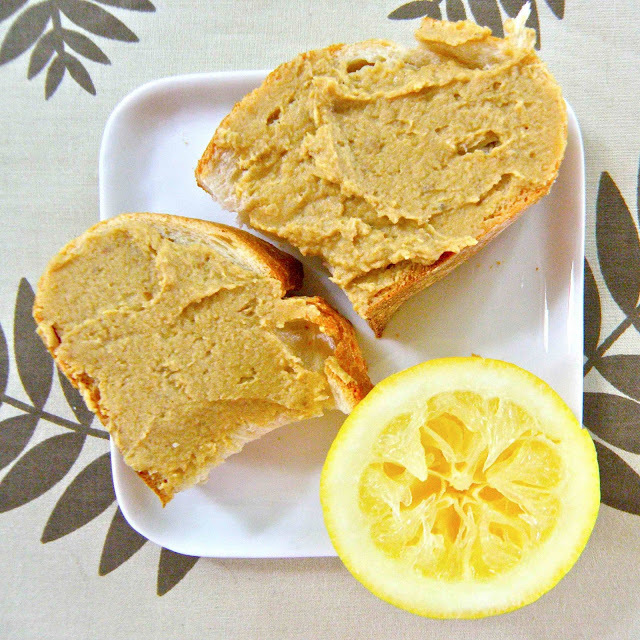 Marinate at room temperature for 30 minutes or in the refrigerator for up to two hours. If you marinate in the refrigerator, take the meat out 30 minutes before you plan to cook it to let it come to room temperature. Heat a George Foreman grill or a heavy skillet over medium-high heat. Cook the steak to your desired doneness. Set steaks aside on a plate, covered. 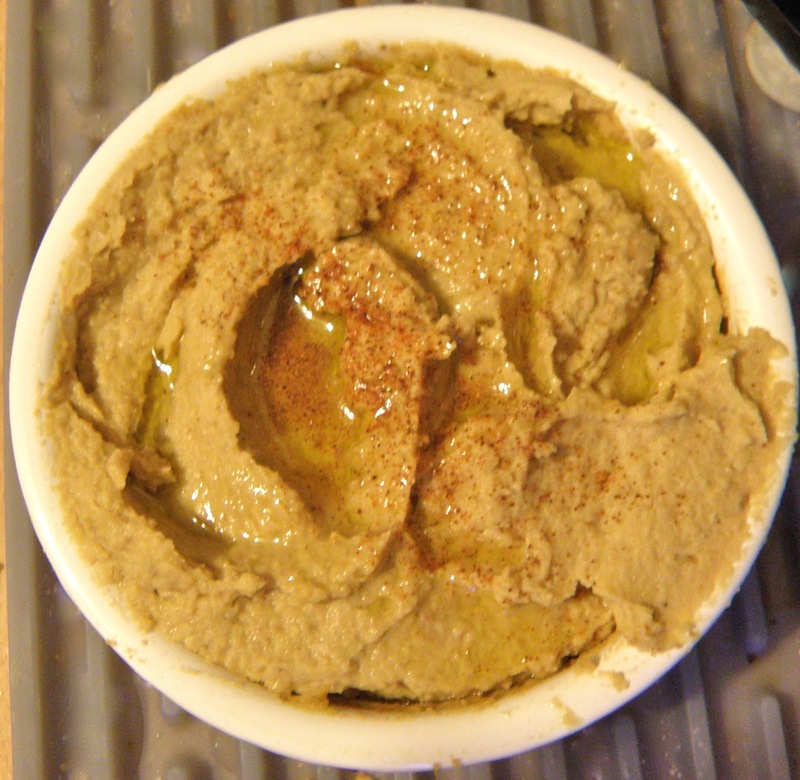 In a medium bowl, combine the almond butter, sesame oil, coconut aminos, and apple juice to make a smooth sauce. Toss the zucchini to coat it with the sauce, and divide the zucchini between two plates. Slice the steak into strips and place it on top of the zucchini. 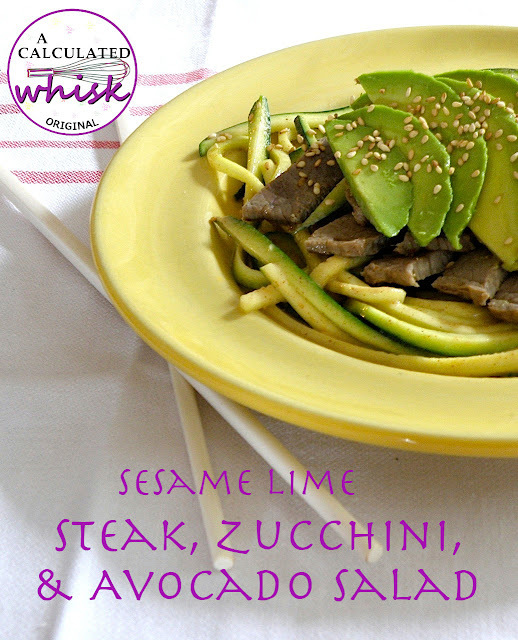 Top the steak with the avocado slices and a sprinkling of sesame seeds. 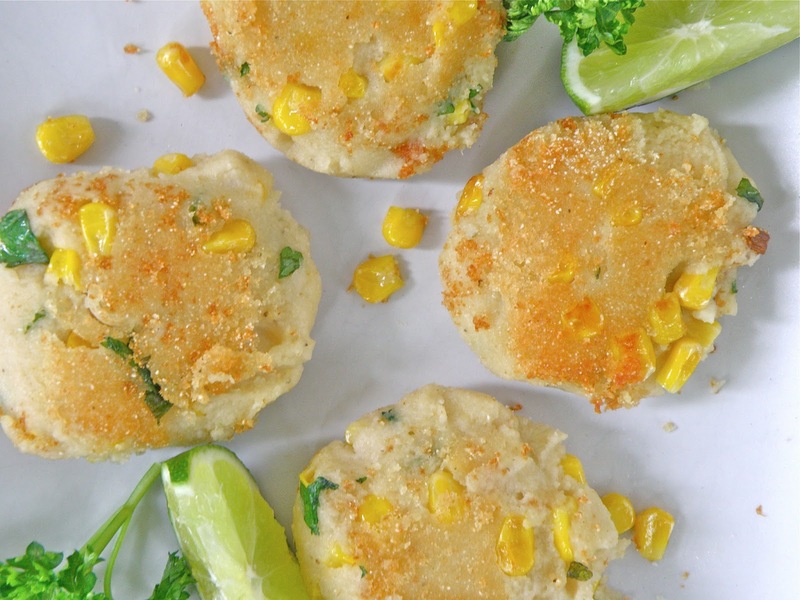 Serve warm or chilled with lime wedges. Okay, big news. 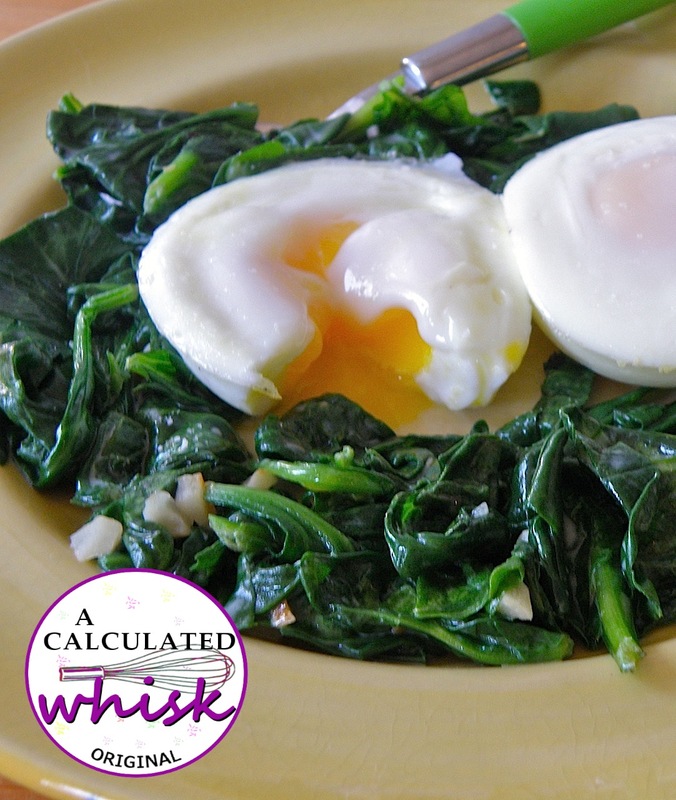 A Calculated Whisk is going paleo for one month. There. I said it. Now if I go and try to post some kind of insane ice cream cupcake cookie sandwich, you guys will call me out on it. Right? Nobody tells you this, but the ugly downside of starting a food blog is you EAT so much of the delicious food you make that your figure kind of falls by the wayside. I love desserts, obviously, but you can only have so much. It’s time for a change. In the past I’ve lost a lot of weight following the Zone diet, but this time I wanted to try something different. I’ve been hearing so much about paleo, and it makes sense to me that eating the foods we evolved eating would be the healthiest way to go. 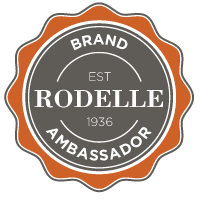 I checked out this website for the Whole 30, and thought I would give it a try. I got The 30 Day Guide to Paleo Cooking: Entire Month of Paleo Meals , and I’m ready to go. The book is great, but I always think it’s more fun to create my own recipes. So, here it is! My first paleo breakfast. It tastes great, and I didn’t feel like anything was missing since it’s so filling, rich, and creamy. Oh, and by the way! I’m on an exercise program, too. I’ve started barre3‘s 28 to Great. That’s six days of workouts a week (they have an awesome online library of 10, 30, 40, and 60 minute videos) for four weeks. I’ve done two workouts so far, and they are exhausting. It’s really targeted muscle work and I can tell it’s going to have an impact. Phew. 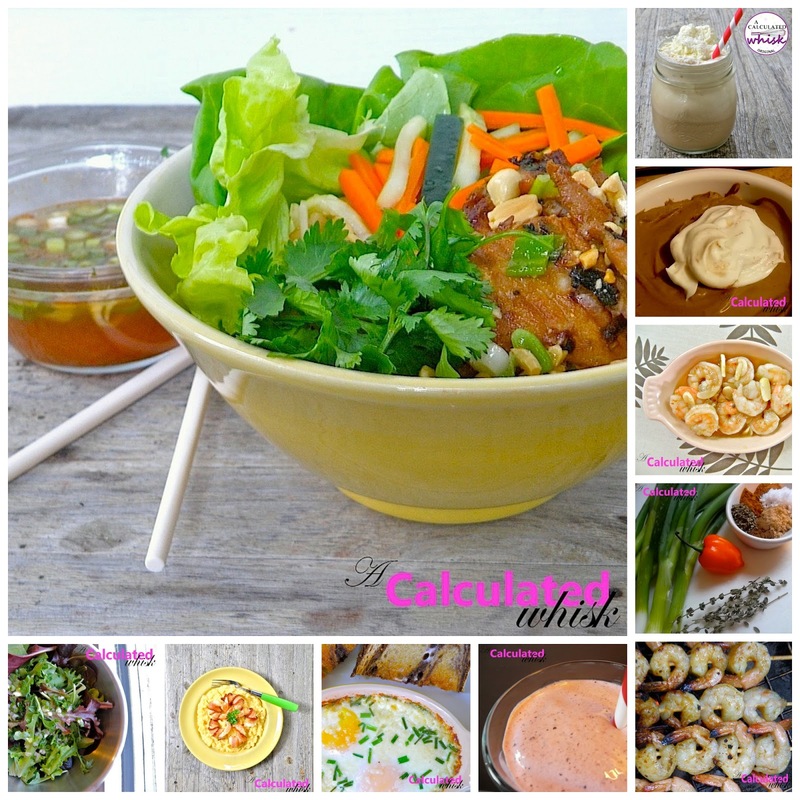 This is a lot of changes, but I hope you guys will support me and try some of the recipes. Let’s start with the most important meal of the day. In a large skillet, heat the coconut oil over medium low heat. Add the garlic and saute until it starts to brown. Turn the heat up to medium high, add the spinach, and season with salt and pepper to taste. 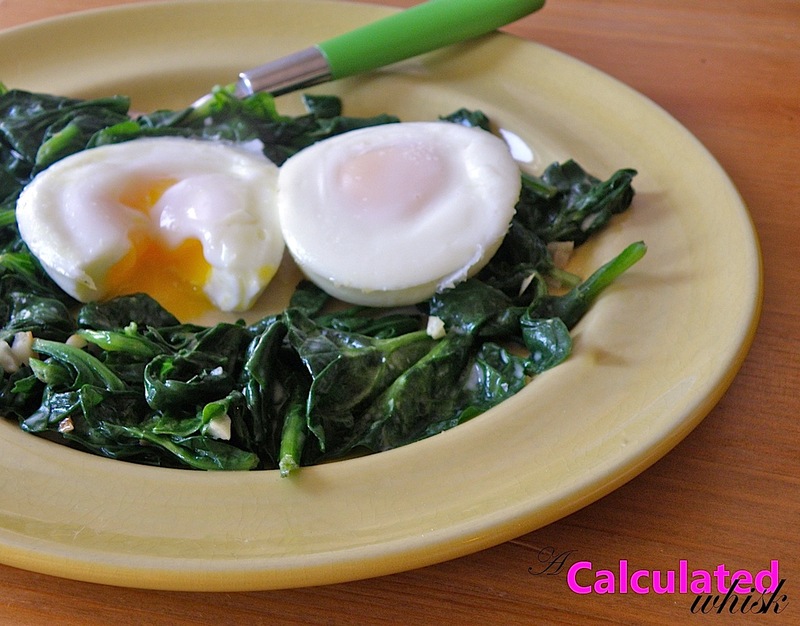 Cook the spinach, tossing frequently, until just wilted, 3-5 minutes. Turn off the heat and stir in the coconut milk or cream. Meanwhile, poach your eggs. See this post about how to do it on Smitten Kitchen, or use an egg poacher. I greased the cups of my egg poacher with a little bit of coconut oil. 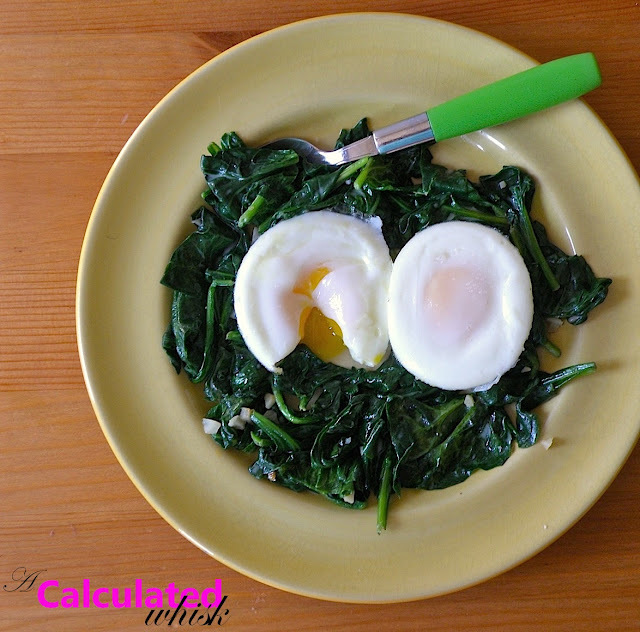 When the spinach is ready, make it into a nest on your plate. Slide the finished eggs into the nest, sprinkle with more salt if desired, and serve hot. Did you know that arugula is called rocket in the UK? Arugula is a pretty fun word, but rocket is even better. 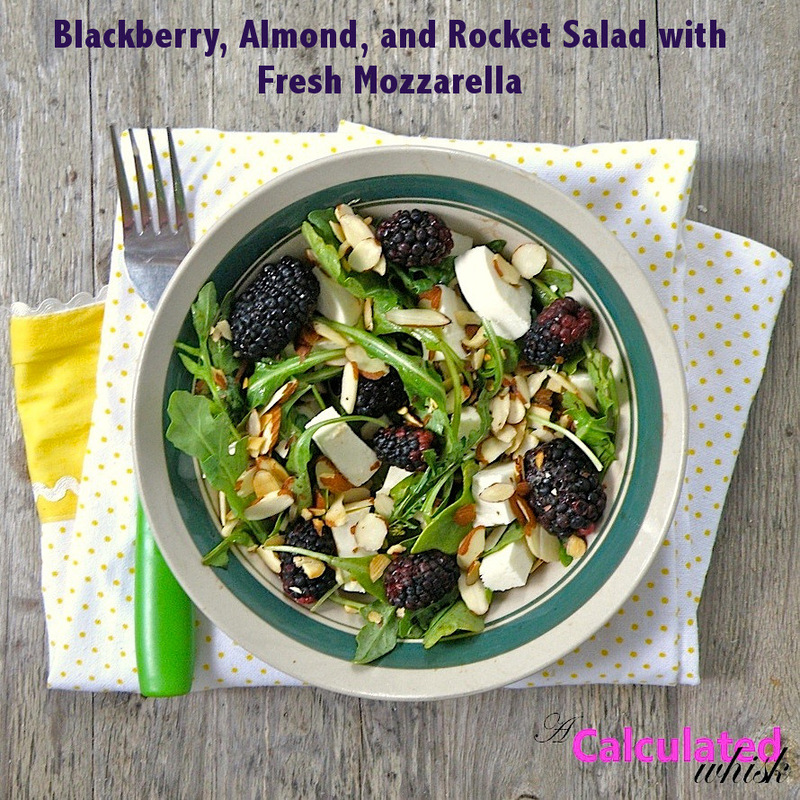 This salad has rocket in it, along with all the other delicious things listed in the title. After making blackberry cupcakes for this month’s Get Your Chef On challenge, I wanted to do something else fabulous with the rest of my juicy blackberries. I dreamed up this salad, and thought about it all day during class. I was happy to find that it was even better than I had imagined! 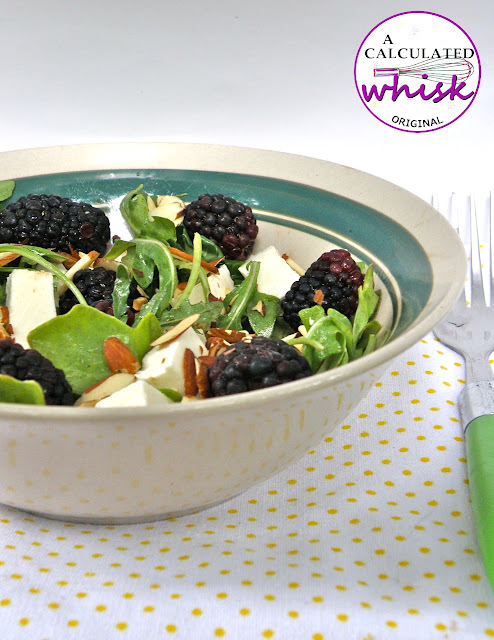 The spicy arugula, sweet blackberries, creamy mozzarella, and toasty almonds are the perfect combination. This is my new favorite summer salad. Ben loved it, too! When I served it he said it looked fancy (secret–any salad with blackberries looks fancy! ), and then he asked for seconds. Usually he’s a one plate of salad kind of guy. So, here’s what I would recommend. Go buy a lot of blackberries, make these cupcakes, then make this salad. A light dinner with a decadent dessert is the perfect thing to have on a summer evening. Toast the almonds in a dry skillet over medium heat, stirring often to make sure they don’t burn, until golden brown (less than five minutes). Set aside to cool. Toss the arugula with the oil, vinegar, and salt and adjust seasonings to taste. To serve, line plate with arugula. Top with blackberries, fresh mozzarella, and toasted almonds. Enjoy! There are lots of Vietnamese stores and restaurants in my neighborhood. On lazy days I do all my shopping at Truong Thinh, the Vietnamese market around the corner, and pick up a banh mi for lunch. One of my favorite places to eat is Pho Hoa, where I love to order the House Special Vermicelli Plate (number 90 in case you’re going–Pho Hoa is a chain and there might be one near you!). It comes with a bunch of delicious things, and rice paper wraps so you can make your own spring rolls. The first time I ordered it, the waiter brought the rice paper wraps first and Ben and I tried to take a bite of them. No dice. They are dry like paper until you soak them in hot water. Oops. Anyway, the house special plate comes with those wraps (and a big bowl of hot water to soften them) and vermicelli, herbs and vegetables topped with grilled pork, meatballs, a spring roll, and shrimp & sugarcane. It also comes with fish sauce on the side. It’s SO good, and the grilled pork is my favorite. I don’t know what they do to it. This dish is my attempt to recreate that dinner at home. I have to tell you, it’s really good, but it’s not QUITE the same flavor I get at the restaurant. You should still make it, though. It’s super yummy and healthy and beautiful (and lots of fun to photograph, if you’re into that). It has a lot of components, but almost all of them can easily be made in advance. When it’s time to eat, just cook the pork and put together your bowl! To prepare the pork, mix all the ingredients for the marinade together and toss with the pork. Cover and refrigerate for at least an hour before cooking. To make the quick-pickled vegetables, pour the vinegar, sugar, and salt over the vegetables and toss to coat. Let sit at room temperature for at least an hour before serving. If you make them more than a couple of hours in advance, store them in the fridge. For the nuoc cham sauce, mix all ingredients together. Taste and adjust seasonings as necessary. For the scallion oil, heat the oil in a large skillet over low heat. 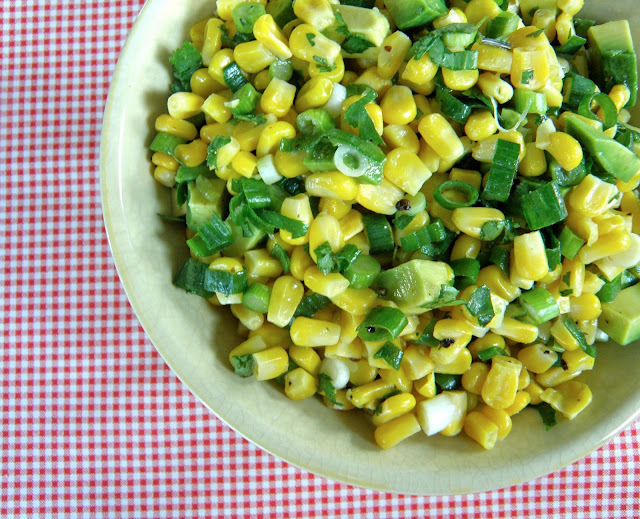 When it’s hot, add the scallions and cook until wilted but still bright green, about three minutes. Pour off the scallions and most of the oil and set aside. Take the pork out of the fridge about ten minutes before you want to cook it. Prepare the grill, or heat up the same skillet you used for the scallion oil over medium high heat. Cook the pork, with a little marinade spooned on top, on both sides until browned and cooked through. Brush cooked pork with the scallion oil before serving. 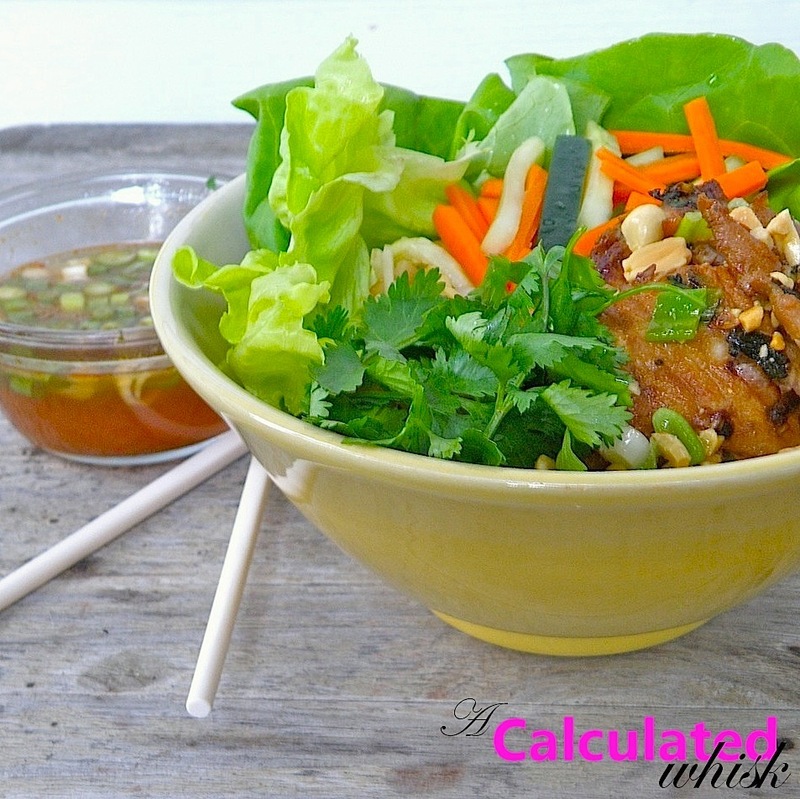 To serve, line a plate or bowl with lettuce leaves and vermicelli. Top with pickled vegetables, bean sprouts, pork, and roasted peanuts. Serve with nuoc cham sauce on the side. Guess what? In only 20 minutes, you can have rich, chewy chocolate almond cookies with no gluten, no butter or oil, no egg yolks, and no dairy! It sounds too good to be true, but these cookies are really delicious! You’ll end up with a couple of egg yolks, which you could save for ice cream. The bad news is that my bag of almond flour is now almost gone! I’ll definitely be buying more. 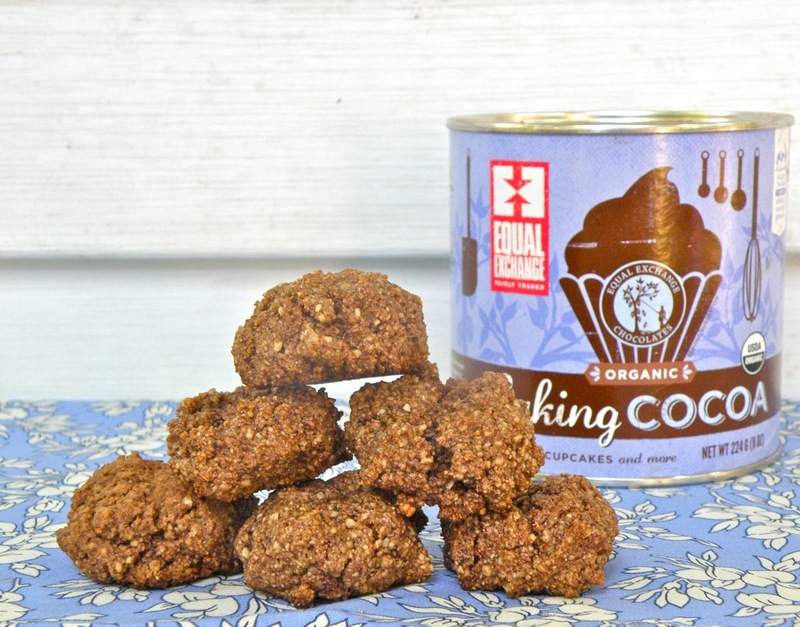 From financiers to mocha brownies to these cookies, it’s my new favorite healthy baking ingredient. Go get some and make these today! Note: You won’t taste the coffee in these cookies–I just added it to bring out the chocolate flavor. You can leave it out if you want a decaf cookie :0. Preheat the oven to 350, and line a cookie sheet with parchment paper. In a medium bowl, mix together the dry ingredients. Add the egg whites, vanilla, and almond extract and stir until the dough comes together. Drop tablespoon-sized balls of dough onto the parchment paper, and flatten the tops slightly with your hand or a spoon (the cookies will not spread much at all while cooking). Bake for 10-15 minutes, until crisp on the outside but not burned on the bottoms. Cool on a wire rack. I made lentils the other day, and was really surprised at how good they were. They were easy to make and flavorful. We served ours on top of pearl couscous, my new favorite grain product. It made a great healthy dinner, and we had tons of lentils left over. (my other favorite grain product). If you have leftover lentils, these are very easy and quick to make. If not, you should make this first recipe and have it for dinner with rice or couscous. The next day, you can make the fritters with the leftovers. Heat the olive oil in a saucepan over medium heat. Add the onion, garlic and cumin and saute until softened, about five minutes. Raise the heat the medium high. Add the lentils, water, and bouillon. Bring to a boil, then reduce heat and simmer, covered, for about twenty minutes. The lentils should be tender and lightened in color, with almost all the liquid absorbed. Add the wine and salt and pepper to taste. Raise the heat and cook for another 2-3 minutes. Stir in the cheese, if using, and stir until smooth. Serve over rice or couscous with scallions and cilantro on top. 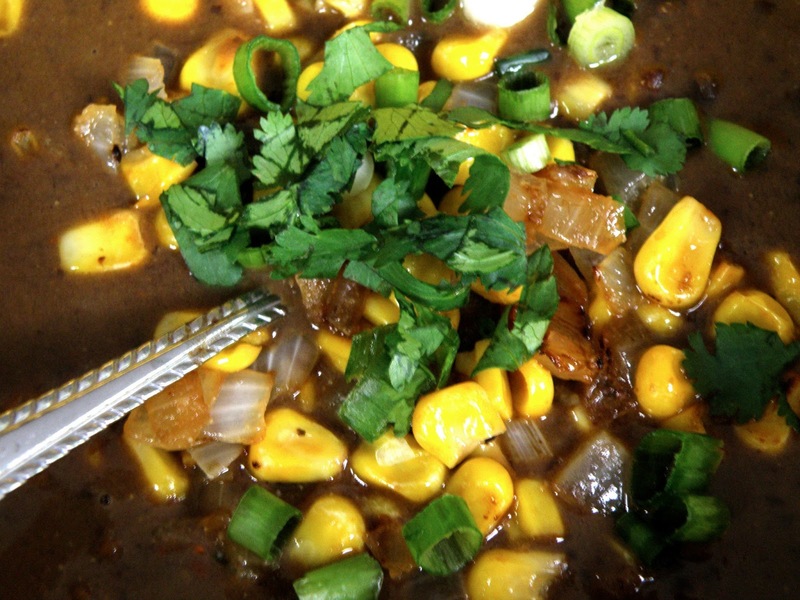 In a large bowl, mix the leftover lentils, corn, scallions, cilantro, masarepa, and a pinch or two of salt. Add the hot water and stir to combine. Let sit for five minutes. Meanwhile, heat about 1/8 inch of oil in a heavy skillet over medium-high heat. When the oil is hot enough, a droplet of water should bounce and skitter across the skillet. Using your hands, make balls of dough a little larger than golf balls and flatten them slightly to form patties. Fry until golden brown on both sides, about 3 minutes per side. Be gentle when you flip them–you’ll lose a few pieces of corn, but that’s okay. Drain on paper towels. Serve hot, with sea salt sprinkled on top and lime wedges for squeezing over. 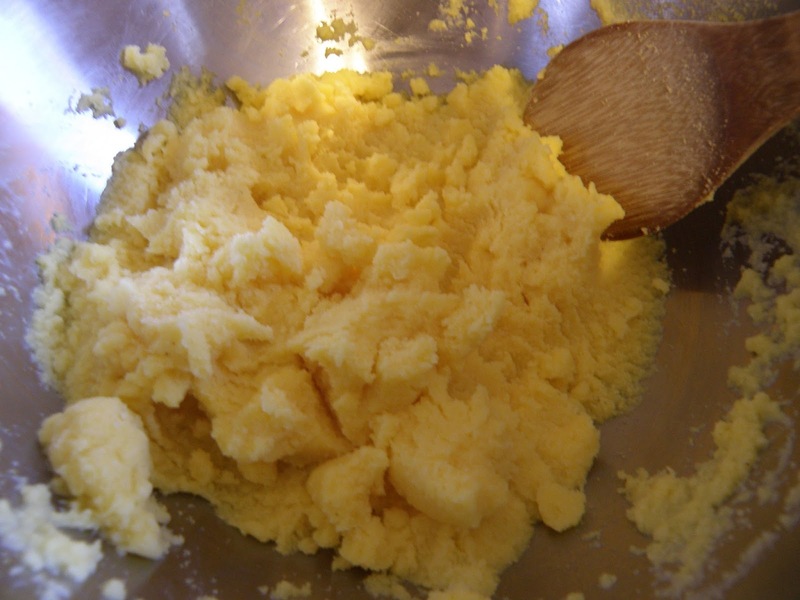 Extra uncooked fritter mixture can be kept for up to three days in the refrigerator. This is a delicious pantry soup, meaning you can make it with ingredients that might already be in your pantry. It’s healthy and filling, and topped with lots of good stuff. Also, it comes together in less than half an hour and packs a little mini punch. Yum! P.S. I am calling this a bisque, because it sounds so much fancier than soup. However, according to Wikipedia, bisques have to be made with seafood stock. Oh well! No seafood here, but still delicious. Heat the butter or olive oil in a skillet over medium heat. Add the onion and corn, and raise the heat to medium high. Stir in the garlic paste and sprinkle with salt and pepper. Cook, stirring occasionally, until golden brown, about ten minutes. Remove from heat and set aside. In a saucepan, heat the olive oil over medium-high heat. Add the beans along with their liquid. Add the oregano, cumin, Adobo seasoning, cayenne, and water. Stir to combine. Simmer for ten minutes. Towards the end of the cooking time, stir in the tequila and let it bubble away for another minute or so. Remove soup from the heat. 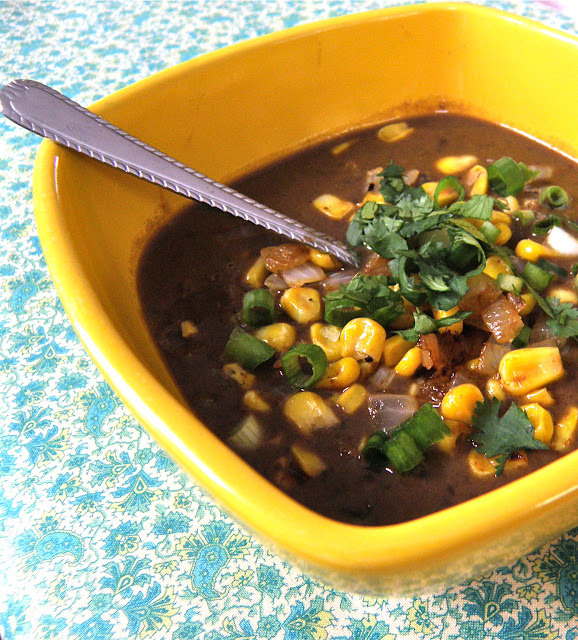 Using a slotted spoon, remove about half of the beans and puree them in a food processor until smooth. Return the puree to the saucepan, add the cream, and stir to combine. Serve the soup with a generous scoop of corn and onions, and a sprinkling of scallions and cilantro. I LOVE curry made with coconut milk. It’s the most delicious thing ever. But, I am not the biggest fan of rice. I mean, rice is fine, but for me it’s nothing to write home about. But, noodles? Noodles are my jam. All kinds of noodles. Italian noodles, Asian noodles…where are the noodles in Indian and Mexican cuisines? Big problem. Someone get on that quick. Anyway, whenever I see noodles, I’m interested. 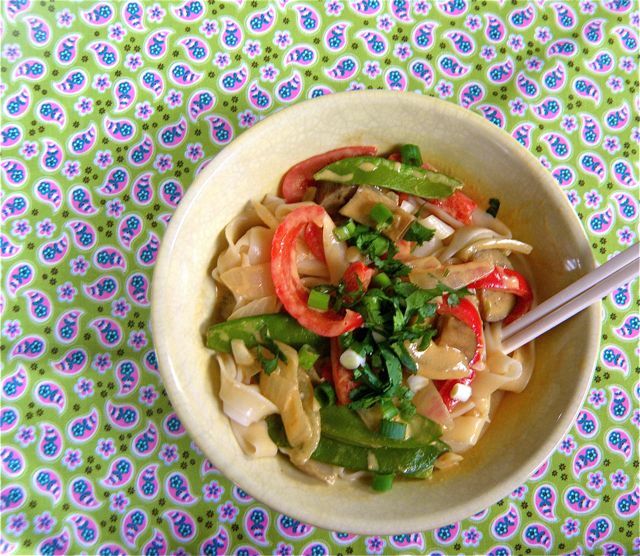 Even in places where noodles might not seem to belong–bring on the noodles! One of my favorite Thai restaurants has a dish called Noodle Curry, which is a delicious yellow curry served over udon noodles. Genius! 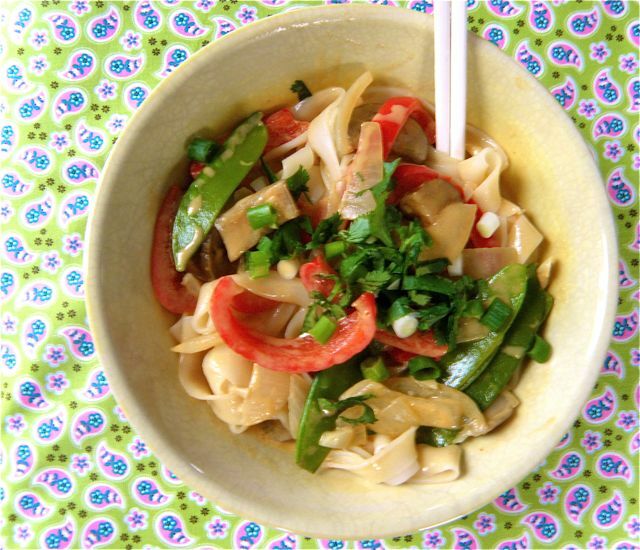 Curry and noodles are a match made in heaven. Watch out, rice. You ain’t got nothing on noodles. Boil water and cook the noodles according to the package directions. Drain and set aside. Heat the coconut cream in a skillet over medium-high heat. When it bubbles, add the curry paste and stir to mix. Add the eggplant and cook, stirring occasionally, for about ten minutes. Add the pepper and onion and mix well. Cook for five more minutes. Add the garlic, fish sauce, coconut milk, brown sugar, and snow peas. Cover the pot, and turn the heat down so the mixture simmers. Cook for about five more minutes, or until the snow peas are cooked but still crunchy and bright green. 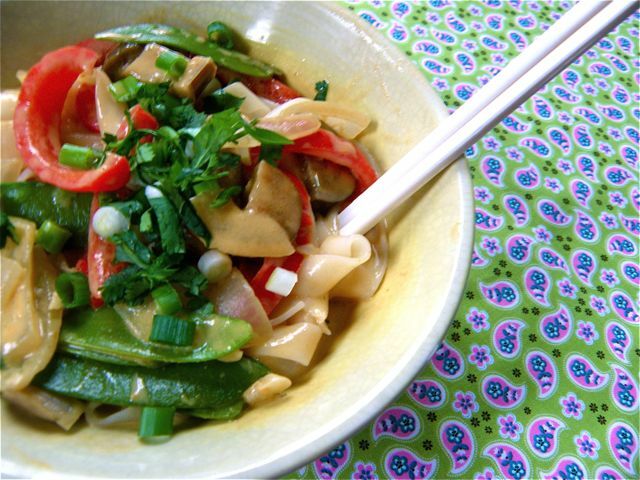 Serve noodles in a bowl with vegetables and curry spooned on top. 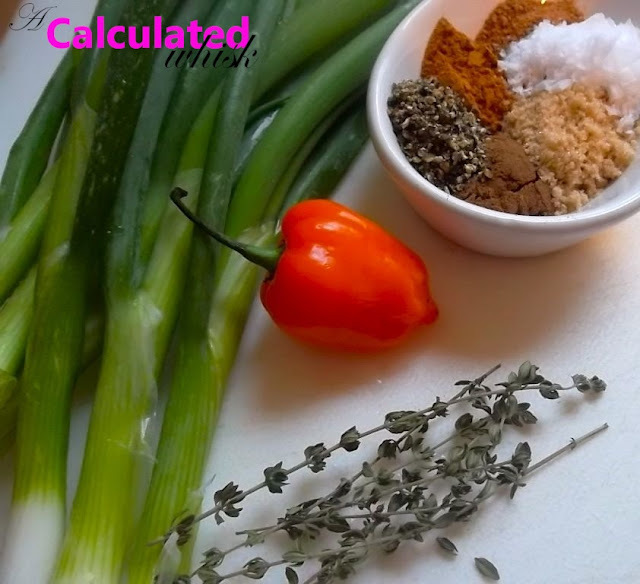 Garnish with chopped scallions and cilantro and serve hot. I have been dying to make something with avocado ever since I got Gaby Dalkin’s amazing cookbook, Absolutely Avocados, in the mail. 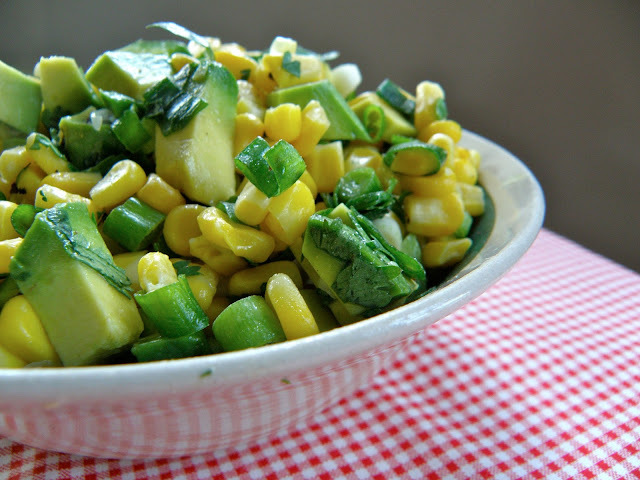 Tons of bloggers have been posting recipes from her book in honor of its release, and after I saw Recipe Girl’s photos of Gaby’s Bacon, Avocado, and Corn Salad, I was determined to make that. However, due to a bout of laziness, I was only able to make it to the small Vietnamese store down the street. No bacon, no cheese, no fresh corn. I was forced to re-imagine my dinner plans. caught my eye, and guess what? It had a super easy recipe for arepas right on the back. 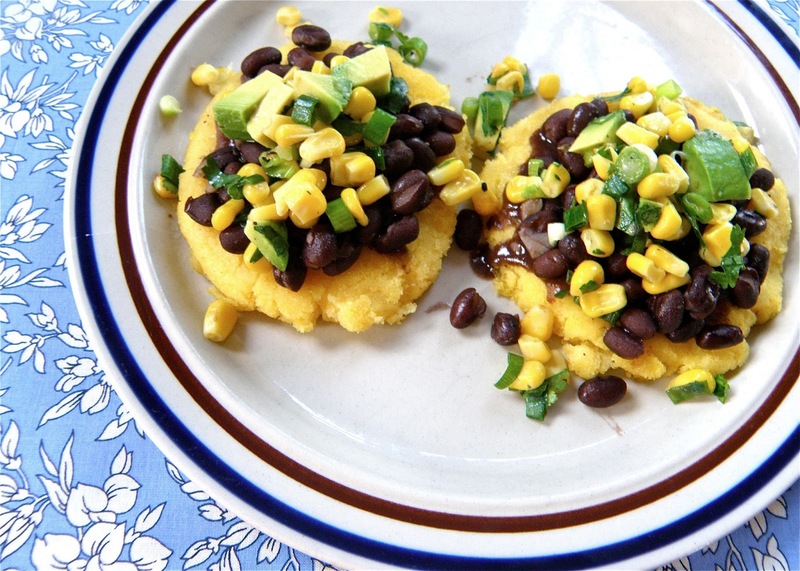 If you’ve never had arepas, you need to try them! They are a lot like pupusas, and super easy to make. 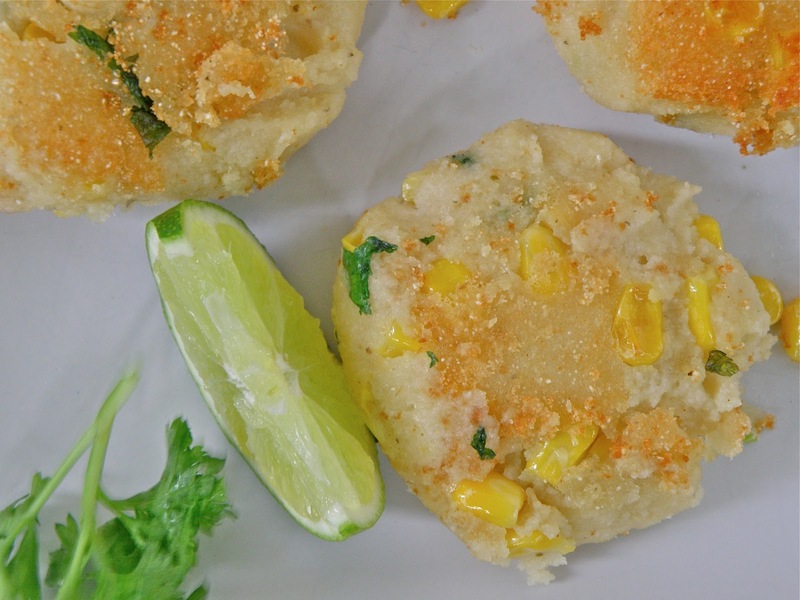 If you live in Boston, you can choose from all kinds of delicious, cheese-stuffed arepas at Orinoco. Either way, you should definitely try this recipe. Serves 3-4 as a main course or 8 as a first course. Heat the butter or olive oil in a skillet over medium heat. Add the corn and season with salt and pepper. Cook for about five minutes, until the corn is tender. Remove from heat. After the corn cools a bit, combine with the rest of the ingredients and add more salt, pepper, and lime juice as needed. Heat the olive oil over medium heat, and saute the garlic until fragrant and lightly browned. Add the beans, water, seasoning, and vinegar. Bring to a boil, and then simmer for ten minutes. Taste for seasoning, adding sugar and/or salt as desired (I used a bit of both). Mix together the masarepa, water, and salt, and let it sit for five minutes. Heat the butter or olive oil in a heavy skillet over medium high heat. 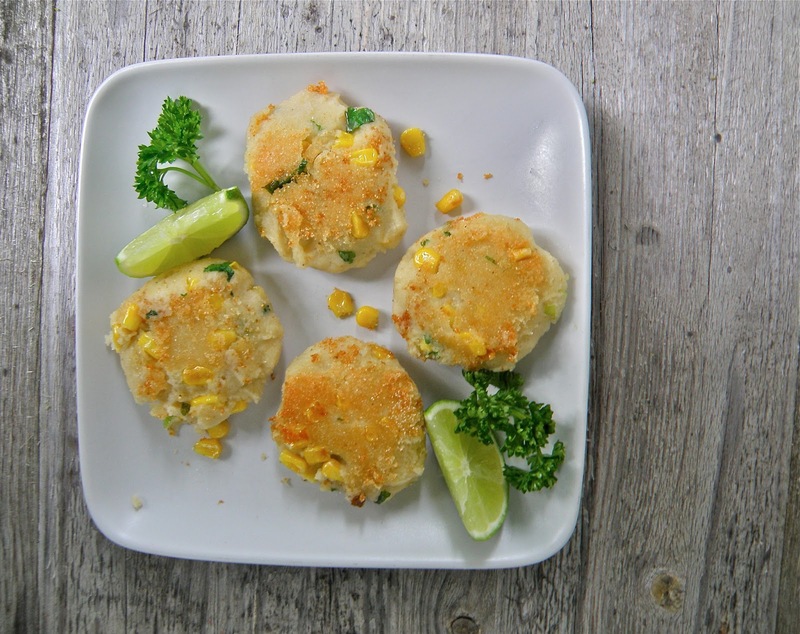 Use your hands to form patties that are about 4 inches wide and half an inch thick. Make sure the skillet is very hot before you add the arepas. Cook until browned and crisped on both sides, 10-15 minutes total. I recommend letting the arepas sit for the first five minutes without moving them, because at first they are vulnerable to falling apart. The recipe said you can mix in some shredded cheese right before forming the patties, so I might have to try that next time. Let me know if you give that version a whirl! 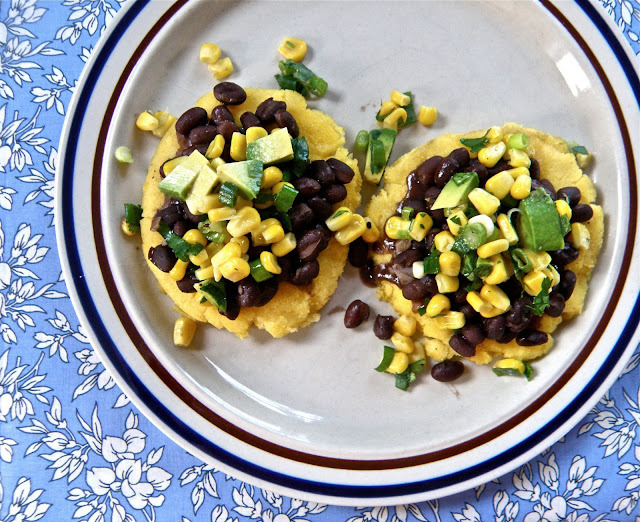 Serve the arepas topped with beans and salsa, with a wedge of lime for squeezing on top. This is a perfect recipe for Cinco de Mayo! Do you have plans to cook anything else fabulous for the big day?